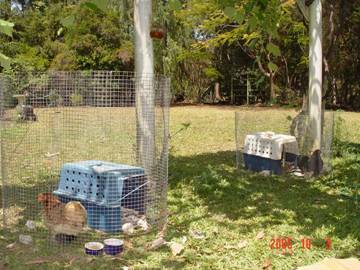 An article from a few years ago published by Karen Johns on Backyard Poultry. Many poultry keepers new to the hobby are horrified at the aggression poultry can display to each other and the gruesome results, although sadly many keepers fail to recognize a problem and fail to realize what problems aggression can cause. Many will be familiar to the statement regarding “peck order” this was a term used to describe how poultry behave in relationship to their rank in a flock. One hen is dominant over the flock (she pecks all those below her) the next hen is second, then a third and so on. However in many cases I have observed the lowest ranking hen can boss the top ranking hen. Poultry are naturally aggressive within a species and between species. Hens will not accept chicks unless they have hatched them themselves. Then a hen can sometimes turn on one or all her own chicks. Other hens and in many cases roosters, but not all, will make chickens lives miserable with constant bullying and will commonly kill a defenceless chick. Sometimes there is no apparent reason for a hen to turn on her chick. Bringing in a new hen will cause disruption to a peck order and if this hen fails to prove itself life can be very miserable for it, especially if it cannot escape the constant harassment. 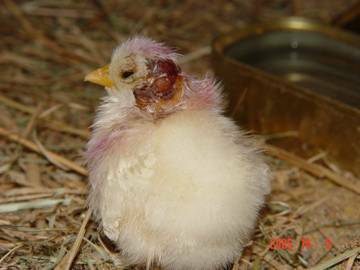 Some hens seem to enjoy making another hens life miserable and make a point of bullying it. In some cases a bird may starve or become ill because they cannot eat and drink sufficient amounts and because stress can make a bird vulnerable to disease, often blamed on the previous owner. Two roosters will never get on. If another rooster is introduced into a pen there will be a fight for dominance. Even if two or more roosters do tolerate each other hens will be harassed and competition for the hens cause undue stress (helping cause disease and loss of production) and sometimes infertility of eggs as neither rooster is able to mate properly. Roosters have big egos. But then they may bravely want to defend their wives. This battle, if there were no wire between the two, would be very in favour of the larger silver Sussex rooster and very much to the detriment of the little lavender Pekin bantam. So remember, if you have chicks, keep them in a separate pen to the main flock (with there mother until she has had enough of them). Keep only one rooster. Don’t mix ages. And when introducing new birds to a flock observe for signs that all is not going well and intervene if necessary. 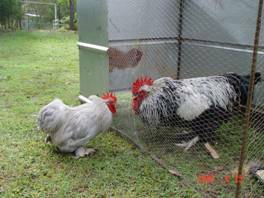 A good rooster will often act as mediator between squabbles. Isolate the hen with chicks, from the flock and from the other hens and chicks. This causes less stress for the keeper and the birds and as a result a healthy happy clutch of chicks can be raised. That's a great little article with heaps of good and very sensible advice. Thanks for posting it, Cathy. Interesting article, thanks for posting Cathy. They are sweet hen-and-chicks temporary homes. Would they be moved somewhere more solid at night? They would last about twenty minutes here with the fox problem. Good article on general aggression, worth the repeat. People are funny though: today (before I read this thread) someone asked me some questions on this subject - I answered pretty much as the article's info. And of course got the answers, oh but my roosters aren't aggressive they are okay together, my hens are all good natured. Which left me wondering why the questions. I guess some people just believe what they want to believe - poor chooks, but. Well i think i have broken all these rules. Thanks for the information. Maybe i have had different hens, but I have on a few occasions had more than one hen mothering the same chicks. The last time it was a beautiful experience, seeing the two mums and their brood. Unfortunately i lost both the mums to a fox. The rooster and another hen snuggled the chicks (who must have been about 5 weeks) and looked after them. I think what is described in the above article is the best way to maximise the odds of things going well. People have varied practices in reality. That will depend on the size of your pens, your property, your breeds etc. i know of cases where multiple broodies have brought out chicks together and they've done well. I also know of stories where it's all gone terribly wrong. If doing it, the risks are higher that a hen will injure chicks by either being hostile to it or trying to get it away from another hen. You would have to watch the situation closely and be prepared to intervene if necessary. Good post, people (esp newbies) sometimes forget that poultry are intensely territorial and the term "pecking order"
is not just a flippant phrase. Yes good general rules but not always the case, I removed the infertile eggs from under one hen at night and placed 1 week old chicks under her, in the morning as far as she was concerned they were hers and mothered them perfectly. I had 1 large Rooster with he's hens and a Bantam Rooster with he's hens who had separate coupes but during the day shared the large run, they ignored each other and just kept to their own hens as groups. But I introduced a Silky Roo and the Bantam Roo dominates over him, both are going soon as now have Lavender Aracauna cockerel growing up who is already serving the Hens, Bantam Roo ignores him. Large roo was rehomed to friends who were going to eat him but changed their minds and now he has a nice leghorn harem. I will be keeping only the Ara Rooster.as don't want the Bantam roo getting to the ara hens. Thanks Mycoola. I know its late but one thing I have to say. "Aggression in any of my birds is removed really quickly - no questions asked"
They are treated like I treated my young horses. a sharp but not cruel slap and isolating untill they found their manners. Love it but then I breed for temperament the same as I did with all my former animals. Unfortunately the only rooster out of two perfect lavenders is the fertile aggressive one. the other is infertile. Thanks for posting it Karen.